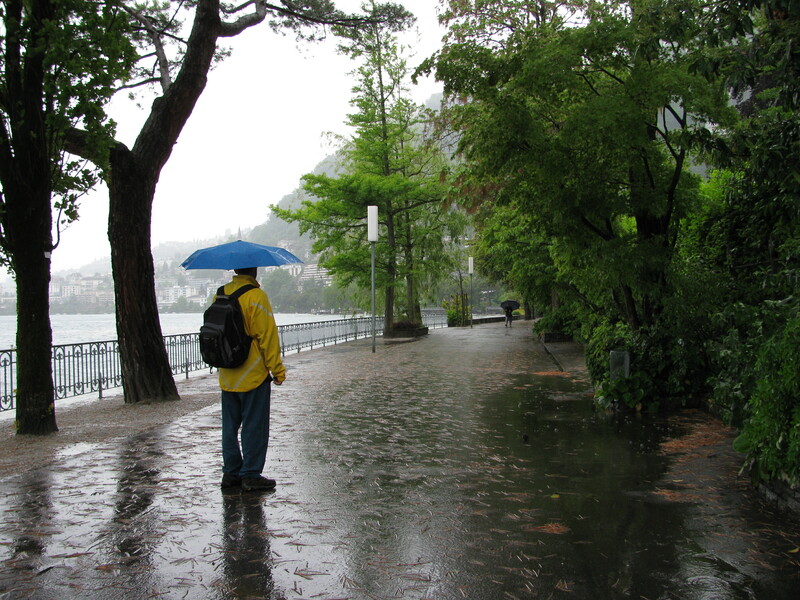 The wet walk between Chateau de Chillon and Montreux, along Lake Geneva. Bus or boat will take visitors from Chateau Chillon to Montreux, but why bother when a world-famous “Swiss Riviera” promenade waits just outside the castle drawbridge? Whether we actually voiced such a lucid question is a mystery even to us, as a cleaving wind and pelting rainfall drowned out our conversation. Despite the storm, we decided to walk. The word “decided” is loosely applied here. 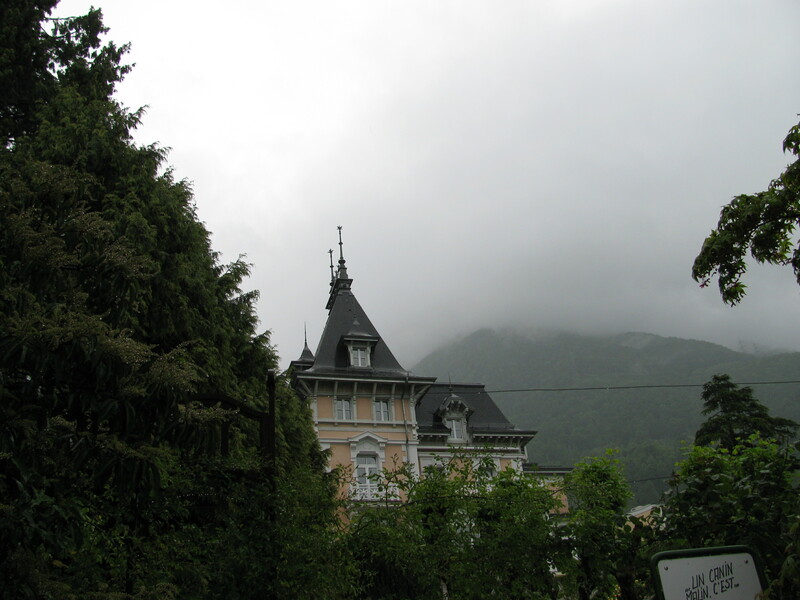 A mansion overlooking Lake Geneva on the riviera promenade toward Montreux. Why do the Swiss call this is a "riviera" when it is on a lake? Part of the problem lies in the “Well, we’re here, why not do it?” syndrome that besets Dave and I in all our ventures. It eclipses all cognitive thought, which means that we rarely decide anything. Dave knows this, and he uses it to his advantage as was seen when he got me onto the Gondola-Ride-From-Hades up a mountainside. I put my foot down, declaring that said foot was staying within reach of the ground no matter what, but Dave slyly coaxed me into walking near the gondola, hence I ended up on it, because of the dreaded “Well, we’re here …” travel tic. I wish there was a cure for this. A sign outside the château claimed the walk to Montreux was 45 minutes, which might be correct, if you’re going at a good clip and not leaning into gale-force winds while keeping a watchful eye on Lake Geneva for signs of rogue waves that might sweep you away to the French side of this massive body of water, all while keeping your ear tuned to the tree branches above for the sound of cracking limbs that might break off and grind your body into the quaint promenade pavement where the Swiss might mistakenly leave you on the assumption that you are some form of modern art. The Swiss do love statues. Even in the storm, the promenade is worth the walk – it starts out narrow with an uneven surface and rather ordinary hedging, but quickly opens up to a wide mall flanked with mansions on one side and a trim botanical garden on the water side. My guess is that this walk is packed on a sunny day, but with the storm in full voice, Dave and I found ourselves alone but for the occasional daring youth biking past and one very wealthy looking man walking his golden retriever, who gave us a friendly (by Swiss standards) hello, probably on the thinking he might see us at “the club” later, because who else would volunteer for this walk but a well-heeled and eccentric local? 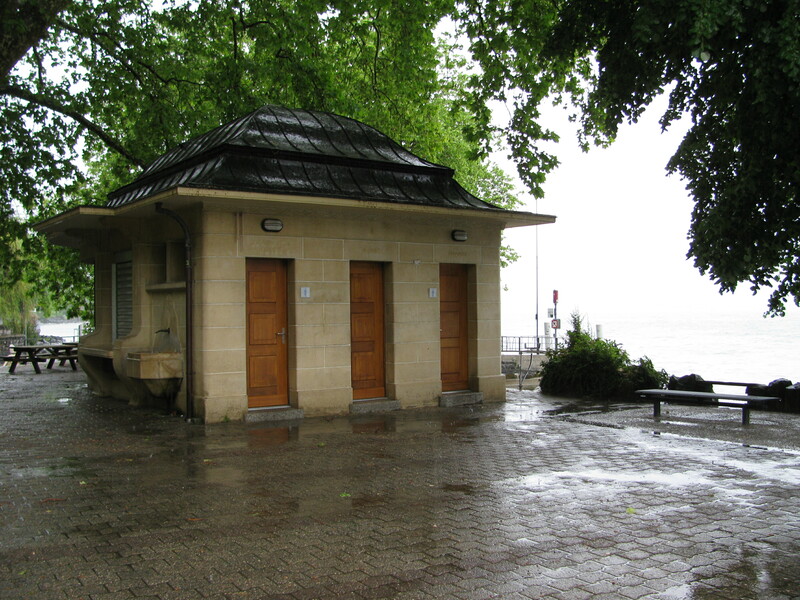 Even the public bathrooms have a stately look in Montreux. By the time we found ourselves alongside the wharf from which we had started our day’s journey, we had walked a total of 5.5 miles weighted down with rain-soaked clothing (the distance includes tramping through Chillon castle) and were ready for some real food. We stepped up to the restaurant La Metropole, also oddly signed “Caesars” by the wharf, where we had earlier seen a rather elite-looking crowd noshing away at tantalizing dishes. If the rich eat here, we thought, the food must be reasonably good. As we folded our badly abused umbrellas, a very French-looking waiter rushed out from the restaurant and motioned us towards one of the outdoor cafe tables, even though the weather was still rather exciting. A glance through the windows told the story – the interior showed off elaborately set tables, sparkling wine glasses, perfectly starched tablecloths, while the reflection in the glass informed us of how poorly equipped we were for such surroundings, my hair whipped into a Medusa fright, Dave’s tanned face now bearing the weather-worn visage of a salty sea-captain. We humbly took our place outdoors, just like the dogs we appeared to be. We counted out our children’s inheritance and figured there was just enough to pay off one’s law school debt and enjoy a steak lunch at this establishment, so we braved it. I am not exaggerating when I say “braved it.” We had an earlier unpleasant encounter with Swiss beef, an experience that surprised us both as the Swiss enjoy a cultural association to beef that is perhaps unparalleled worldwide, except in those countries where the cow is looked on as a deity. 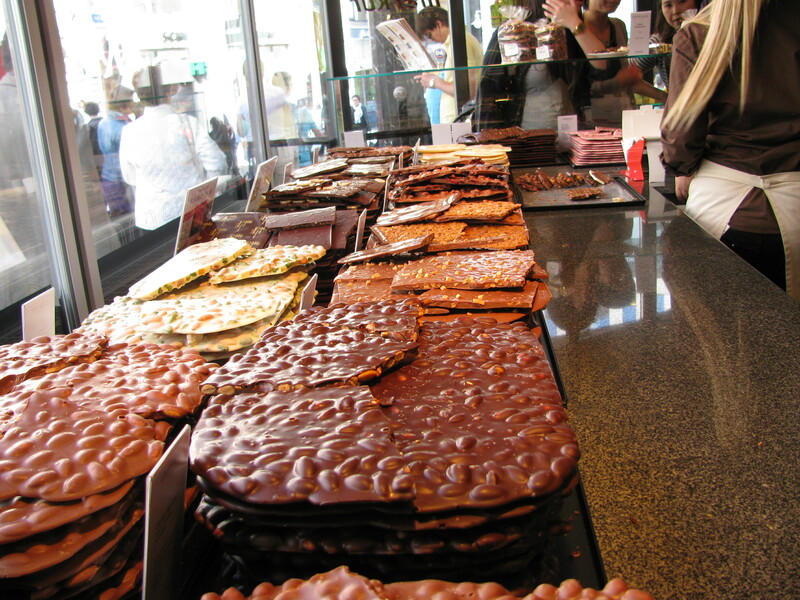 Consider the widely known Swiss cheese and Swiss chocolate, and the less-famous Swiss fighting cows (a true phenomenon according to guide books), and so forth. The delicious "Steak de boueffe" grilled to "medium" at Montreux's "La Metropole" restaurant, which also has the sign "Caesar's" above it. We think the dual-name is a byproduct of multilingualism. I passed up the $45 filet mignon, on the grounds that no one can grill a tenderloin better than my husband and it was unlikely the chefs would let him into the kitchen, and opted for the $35 steak lunch. Dave, still mindful of our children’s inheritance, wisely ordered a sandwich. We then settled in with our lattes to wait the requisite four hours for the meal to show up. Imagine our surprise when our waiter swept up with our dishes before I had worked a quarter-way down the cup. 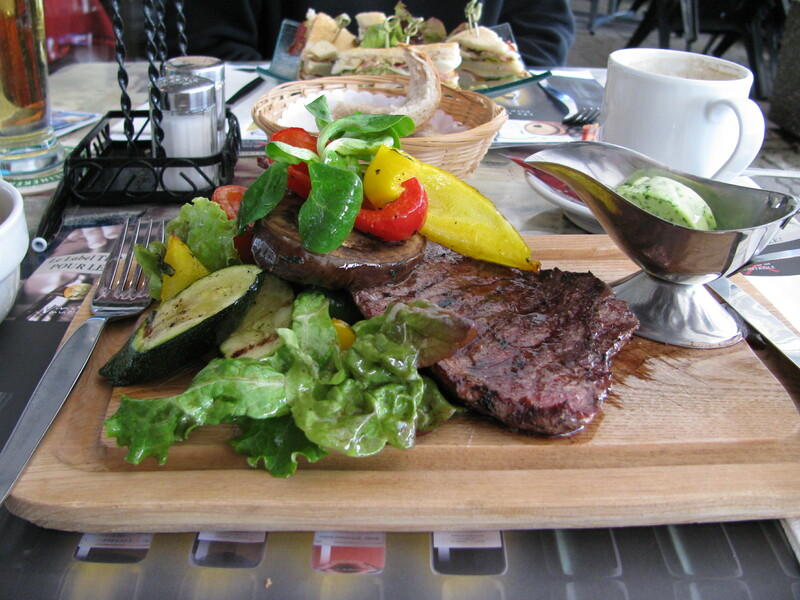 The waiter had taken matters in hand and ordered the steak doneness to medium, which meant that it still quivered on the plate, and chose as its companion, a Cafe de Paris sauce. There are waiters whose instincts are unfathomably correct. This man was one of them. The meat was perfect, tender, and seasoned just so. The Cafe de Paris, which appeared in a dollop of green aspic in a gravy boat carried the steak’s seasoning from wonderful to beyond-heavenly. Our waiter waved away any notion the sauce was extraordinary. “Just parsley, garlic, butter and (indecipherable spice name),” he said. The grilled vegetables were cooked to perfection, lightly buttered, the red-leaf salad was crisp, and the roasted potatoes, which came in a separate bowl, were as good as potatoes can get, which is just to say that no one recognizes a truly great potato dish, yet one only makes note when it is done wrong. This was done right. 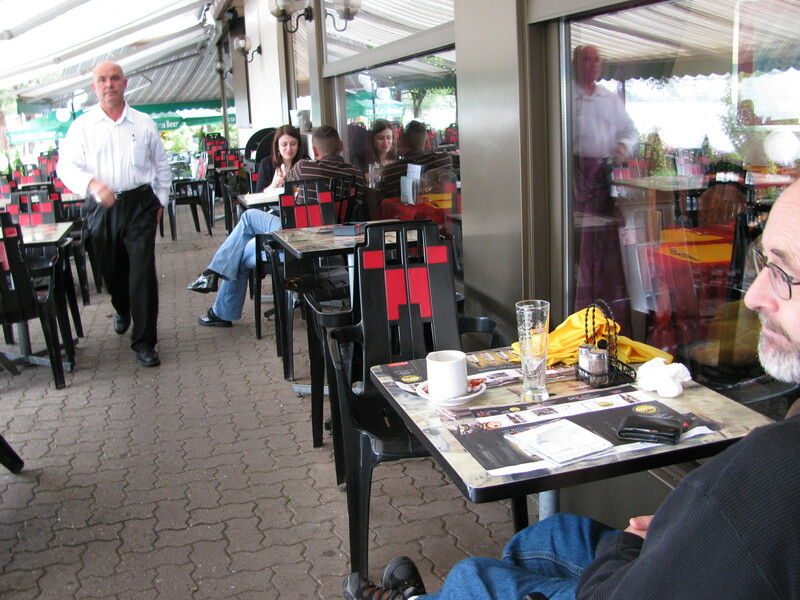 A pricy meal, but very enjoyable with excellent professional service overlooking Lake Geneva. It was a perfect end to our blustery walk, and restored our sensibilities and bravado so that we were able to march up Montreux’s steep slopes to enjoy its 16th-century quarter. What do you think? Does our waiter look French? I think he does and he had a decidedly French accent. 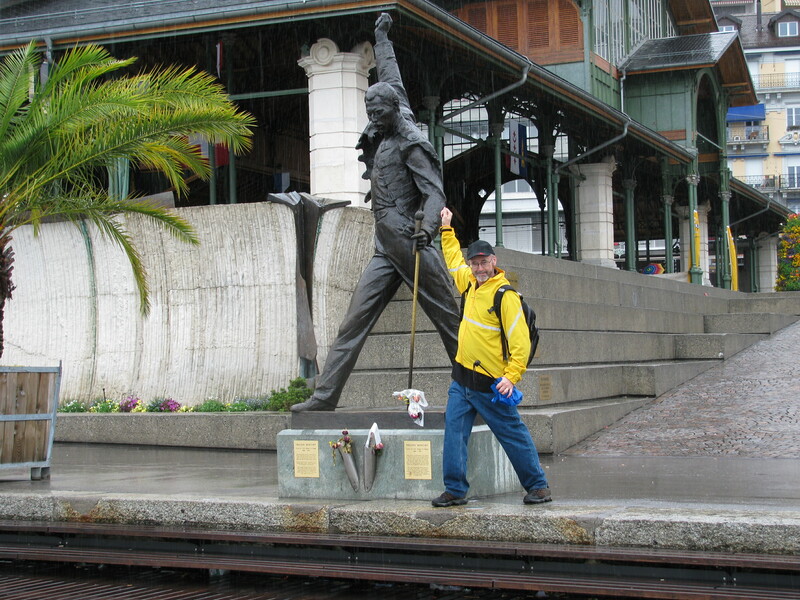 The requisite pose with Freddie Mercury statue. I’m so glad you finally had a good meal. Thanks for including photos of the meal and of the hurrying waiter. Glad your meal was great. I just love it when you taste something that makes your tastbuds dance with joy.